Discussion in 'A Song For You: The Carpenters Forum' started by tomswift2002, Mar 4, 2019.
and it got me wondering if the Carpenters have seen any releases on other formats, besides the more common ones like LP, CD, Analog Compact Cassette, 8-track, Laserdisc, VHS, DVD-Video and reel-to-reel. 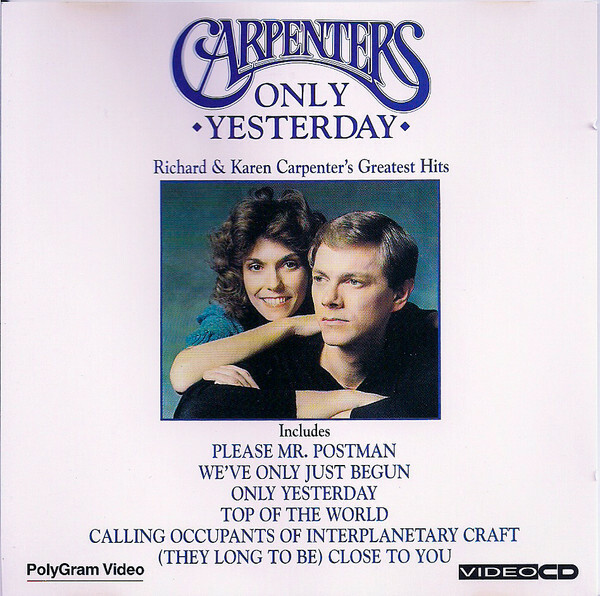 Did Polygram ever do a Carpenters release, such as maybe the Interpretations album on the Philips DCC (Digital Compact Cassette) format (1992-1996), considering that Philips was Polygram's parent in 1994? Well, we know there were a few Quad LPs. I don't think A&M ever did any MiniDisc releases. The only other odd format I can think of was the VCD. I have a copy of ONLY YESTERDAY on that format. I forgot about the VCD. I’ve got that in my CD Collection, since it’s a CD case so it fits in my CD rack. Of course the similarly named CD Video is nothing more than a Laserdisc—-of course it would be interesting to find out if in some other country like the UK A&M maybe put out a CD size CD video disc that had like the “Rainy Days & Monday’s (Radio Remix)” CD audio single and then the video pressed in Laserdisc—-I’ve got a PAL Copy of the Beach Boys/Fat Boys CD Video that has their “Wipeout” single where there are a couple of CD-Audio tracks and then the Video is in Laserdisc format. And speaking of Quad LP’s I guess there were the Quad 8-tracks. What's the difference between a VCD and a DVD? More layers/space? VCD is recorded in MPEG-1 video whereas DVD is MPEG-2. Also VCD uses your average 700MB CD, vs DVD’s 4.7-9.4 GB discs. And for me, I find VCD’s quality is even worst than VHS, even on SLP VHS seems to be sharper, whereas VCD kind of looks like watching something through a window that has been smeared with Vaseline. Over in Asia VCD is still being supported. Unfortunately VCD was like Laserdisc in that if you had a movie longer than 70 minutes, you would need a second disc, just like you would need to flip a Laserdisc after 60 minutes or change discs after 2 hours. There was another obscure format that never really took off called CD-V or CD-Video. It was a hybrid format of CD information and LaserDisc information. Typically a CD-V would contain a single-song video and about 20 minutes of audio tracks. The CD part plays in a standard CD player, and the video part plays in a LaserDisc player. I own one with the Moody Blues "Your Wildest Dreams" as the video and four tracks from THE OTHER SIDE OF LIFE as the audio tracks. I don't believe A&M ever dabbled in CD-V either. But then there arises the question were any Carpenters videos pressed on CED or VHD (most likely in Japan as VHD seems to have only been released commercially in Japan) discs? Offering was released on 4-Track tape (I've seen it show up on eBay a couple of times). It was an early cartridge tape format, predating the 8 Track by several years. My uncle had a Muntz 4-Track player in his car back in the mid 60s. Lots of mini discs released in Japan. The singles box set is in 3” format as are several other 3” singles with long box holders from there. Also the dbx version of the Close to You album. You needed a special dbx decoder to hear the expanded sound. A big flop due to the $20-25 cost of an lp in the 80’s. I find VCD’s quality is even worst than VHS, even on SLP VHS seems to be sharper, whereas VCD kind of looks like watching something through a window that has been smeared with Vaseline. I have only one VCD - Kate Bush’s ‘The Whole Story’. The audio is totally out of sync with the picture. Actually, I’m not 100 percent that it’s an authorised release, and that’s probably why. The mini-CD’s I count as just being regular CD’s and not an obscure format. There were even adapters released for them to turn them into 7-inch CD’s so that the could be played on every CD/DVD/Blu-Ray player. Really mini-CD’s are like 45’s and in general people group them in as LP’s with 33’s. I don’t know about this, but I have ‘Live at the Budokan’, ‘Interpretations’ and ‘Yesterday Once More’ on DVD in CD-size cases. Not all that unusual and this info doesn’t really fit this thread, but these DVD cases just look good. When I said miniDisc, I was referring to the Sony format. It was a digital recordable format that also had stock album releases. Mostly Sony labels I believe. Were there any titles released in the DAT format in Japan? It never caught on here. Cd’s were easier for our picky market. Also were there any RCA format video discs, the forerunner to laser discs, ever made? The player used a needle I believe to read the material. I knew that was what you were referring to. But GDB2LV was talking about the mini-CD’s that were used for singles in Japan or in North America mostly for distributing demo computer software and in the 2006 Singles Box Set. That’s correct. They also released them for sale with 2-3 cuts on each one. I have at least 3 that I bought as imports. I guess another obscure format would be the MQA release of “The Singles 1969-1973”. There is also the Canadian half speed master lp recording of The Singles 1969-1973. Similar to Mobile Fidelity recordings. That one is kind of one of those “on-the-fence” things as half-speed mastering, from what I’ve read, has been referred to more as a gimmick by some audio engineers, sort of like in CD’s the debate over gold vs regular aluminum vs SHM producing better sound. Does it work? Or is there any difference from a regular master? I’ve got a couple of half-speed records and to me they don’t sound any different from regular mastered LP’s. No then CX and DBX, even over digital streams do seem to offer a wider dynamic range than a regular record, so I would classify them as the LP versions of SACD or MQA CD. I agree. I can’t hear any difference from even the Japanese vinyl from the 80’s. It doesn’t sound any cleaner or different from a regular version. Maybe less popping. The Japanese pressings were the cleanest I’ve found, better than the 180g box set l got from Amazon anyway. I have the SACD of The Singles from Japan. It only plays on my all regions dvd unit. I don’t hear any difference. Not near as nice as the DTS 5.1 version. Has anyone bought a MQA disc? I think there are several titles available in Japan. The shm discs are a bit cleaner, but more of a collectors item, not a must have unless you’re a need all Audio Formats Carpenters fan. They don’t play well in my car when it’s cold either. In fact I thought the high end resolution sounded a bit harsh when I listened to them in the car. I had to adjust the treble down a notch. Thanks for any feedback or knowledge of the format and if they’re worth buying. The MQA limited editions of Carpenters catalogue are coming out June 26th in Japan. Listed on CD Japan website. For MQA, here’s a video on it. Really with MQA, unless you are willing to shell out the big bucks for the decoder (and finding a decoder that can decode over optical and coax) it is going to be a format that the average person is not going to be interested in. It really is an expensive format to get in too. It’s amazing how many types of sound the Japanese audiophiles have come up with over the last 20 years. I’ll just stick with the others for now. Thank you so much for that video tutorial. It’s great! I was working at a music store in 1992 when Sony launched this format. Our entire mini-disc section was about 2' x 2' and we only carried about two dozen titles. All of them were by big name Sony label acts like Mariah Carey, Michael Jackson, Celine Dion, Billy Joel and George Michael. I don't believe any of other "Big 6" label groups of the day adopted the format, but I could be wrong. I remember them having a list price that was significantly higher than CDs and I don't recall ever selling one.